2. precisely infusing microliter samples into mass spectrometers without additional transfers, wasted sample or contact with metallic surfaces which adsorb negatively charged molecules. Simply place a tube or vial containing your packing media (in liquid suspension) in the base. Using our FRIT KIT, create a frit at one end of a capillary. Put the non-frit end of the capillary down through the ferrule and into the tube with the packing media. Lock down the cap and open the three way valve. Turning on the gas pressure forces the packing media to flow into your capillary. 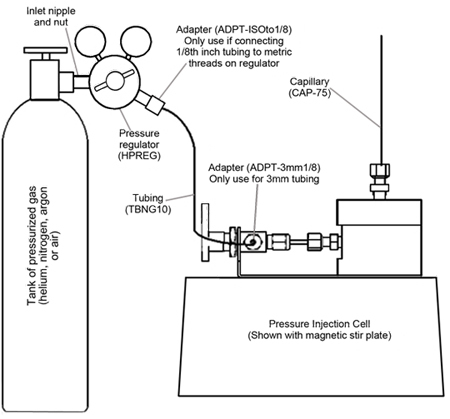 When injecting samples into a mass spectrometer, you can easily adjust the flow rate by controlling the gas pressure.